Avani Chaturvedi. Mohana Singh. Bhawana Kanth. Three women. Three names. What is their claim to recognition? 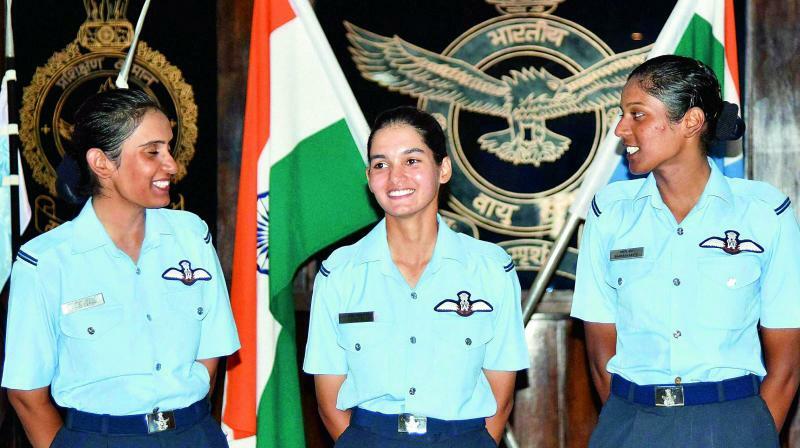 For the record, they are the first three women to be inducted in the Indian Air Force in the fighter stream of the flying branch. Just recently inducted, these three women are a major source of pride for womenfolk in general who have been berating the fact that the fairer folk are not given duties of higher responsibility in the armed forces. Going back in time, in India, the army had switched on its floodlights for women in 1992. In that year, 1803 candidates took the plunge for a slot of 50 vacancies. In 2010, 93 lady officers were taken in, and 166 of them entered the army in 2011. Till a couple of years ago, 1300 women officers were commissioned into the army. For women, a great moment of pride occurred when Lt. Gen. Puneeta Arora became the first woman to become the second highest rank holder of Lt.Gen. in the IMF. She was also the first female vice admiral of the Indian Navy in 2005. Again, she took charge of the Armed Forces Medical College in 2004 – the first woman officer to command the prestigious medical college. However, at present, in the non-medical cadre, women serve as short service commissioned officers or those who serve from anywhere from five to fourteen years. On retirement, they get gratuity and a few other benefits, but no pension. In the medical services branch, they can serve as permanent commissioned officers. In the Army, women are taken in the EME, Signals, Engineers, Army Education Corps, Army Ordnance Corps, Army Service Corps, Intelligence and Judge Advocate General’s branch. In the Navy, women can find employment in all branches except for submarines and divers. In the Air Force, women can be found in technical and administration branches and now even in the fighter flying branch. In coast guard, women find an entry in all branches. An example to be emulated in this aspect comes from Israeli armed forces. This writer, on a trip to the country, was given the information that “Israel is one of those countries in the world which have a mandatory military service requirement for women.” And this is one hat that women don with a lot of pride. And, now back home in India, with the three ladies becoming fighter pilots, we too can happily say this is one sure measure to show that when it comes to both mental and physical prowess, we women are just the same, if not a step ahead of men, or will we be with the awareness governing the human rights and gender equality?